Good morning, everyone! I hope it was a good weekend all around. On Friday afternoon, we looked at ourselves in pure amazement that we had no plans. We ended up having a blend of relaxation, adventures around town, and items checked off our house to-do list - it was wonderful! Going from the apartment to our house, we have many more walls to fill with art. As I've mentioned before, I've enjoyed getting back into painting, and I can't wait to show these final products soon! We went to one of our favorite places on Friday night, Wild Blue Ropes. Each year, for my birthday, I get a free climb plus a discount for any people I bring, so Mike and I took advantage. 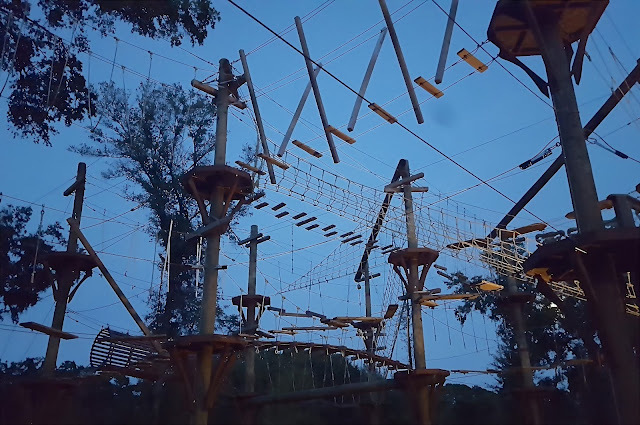 I've tried tons of different workouts in this city: spin, barre, yoga, pilates, but that ropes course tops them all! Plus, it's fun and you feel like you accomplished something. Saturday morning was the best weather for our typical walk around the peninsula and through the Farmer's Market. 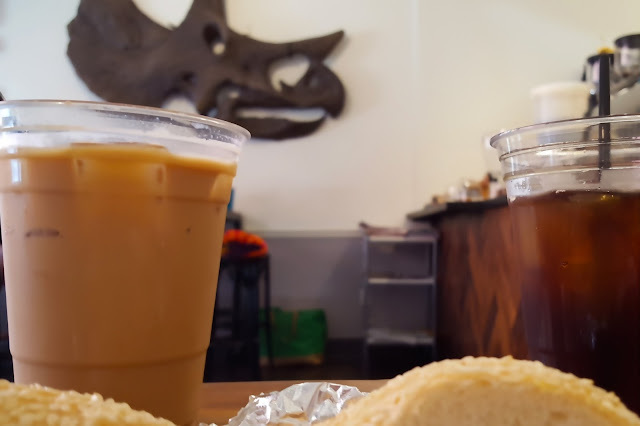 We stopped at Tricera for coffee and bagels and Sugar Bakeshop (for the first time ever!). 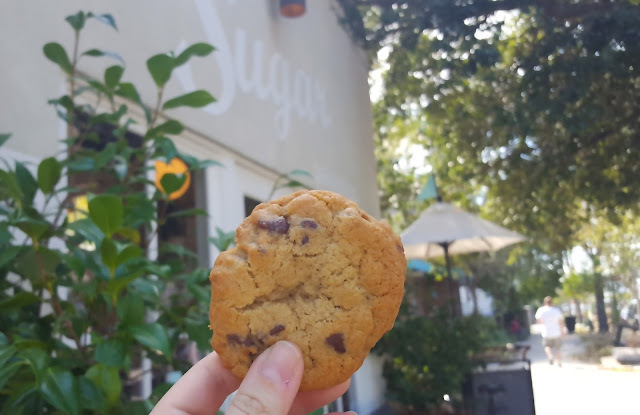 Apparently they have the best chocolate chip cookies in the state, so you know we got some of those in addition to cupcakes. I have been breaking all the fashion rules recently. 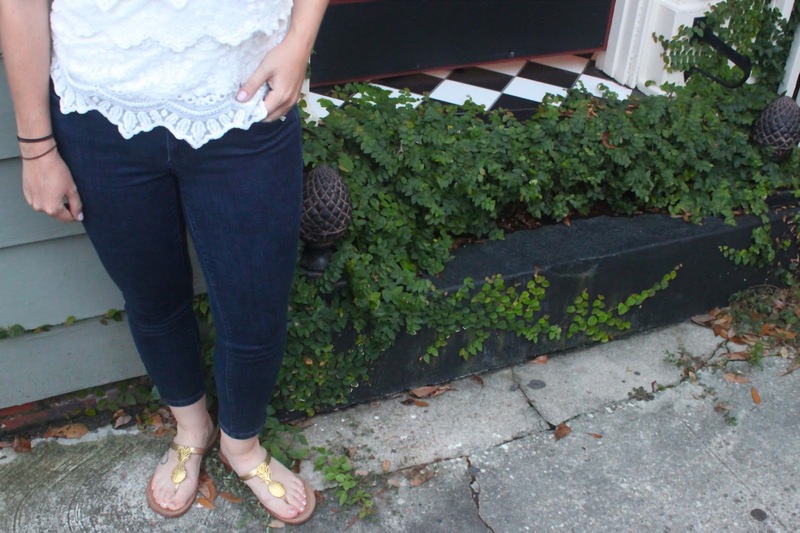 I keep wearing jeans because it's fall but tanks because it's Charleston - haha. I've also been getting so much wear of my white shirts. I just can't bring myself not to wear them. I love denim + white! On Sunday, except for a second trip of the weekend to play tennis, we spent all day around the house. We finally chose the artwork for our living room (those awesome 360 degree photos I shared in my birthday wish list), laid out where they would go, and hung the beachy canvases I printed earlier in the weekend as well as a whole ton of other frames around the house. Finally, the tv doesn't make the house echo - haha! I can't wait to see your paintings! No plan weekends are awesome. Especially when you get to have a mixture of adventure & home time. You are so talented with your painting!! I always forget to do that trick of placement first. All the holes in the wall will attest to that. I like the paintings. 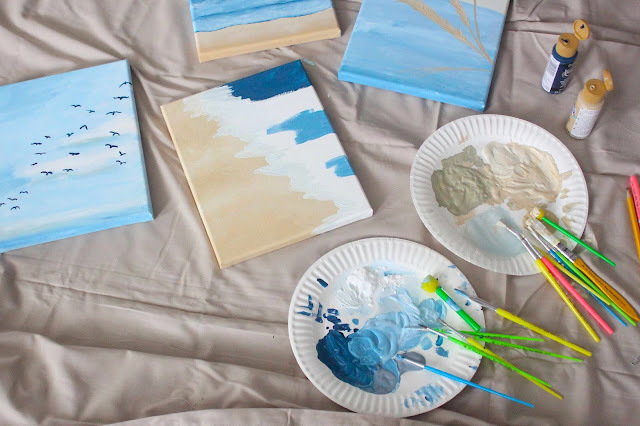 Those would look great in a beach-themed bathroom! You are a Jill of all trades! Love the paintings! The ropes course looks SUPER fun. I wish we lived downtown so we could walk to get a coffee or a bite to eat. A free ropes course on birthdays? How fun!! Totally sounds like the perfect blend of relaxation and adventures! Glad you are getting back into painting, they look great so far! Sounds like a perfect weekend! We finally have one of those coming up this week. Can't wait to see the paintings! Girl, I am all-jeans all-the-time and I have no regrets. Also - I STILL haven't been to Sugar. I need to get over there! A no plans weekend sounds amazing! It looks like you had a great time! Tricera is my fave!! And non-planned weekends are the beeeeeest. Yay for no more echoing in the house! 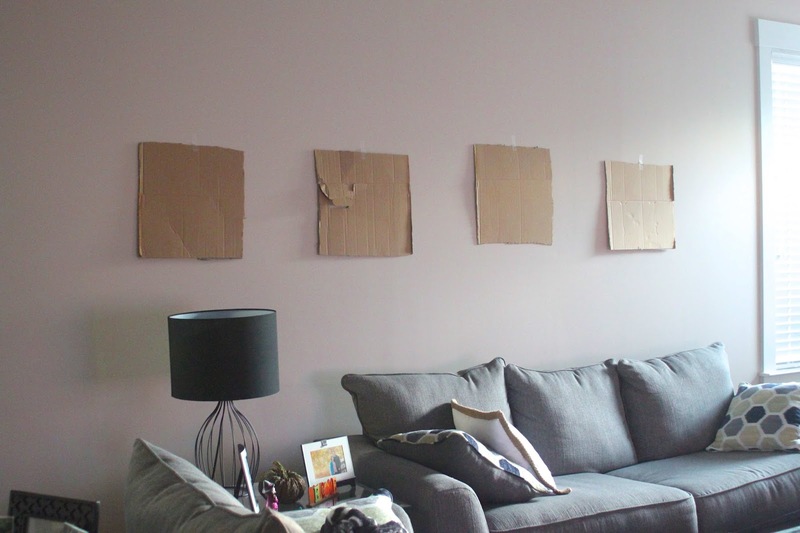 I can't wait to see the finished product of the pictures behind your sofa. I feel honored that you found them while I was with you. It's so nice to have a weekend with no plans once in a while! Your paintings are so amazing! We did a ropes course for my husband's birthday a few years ago and he loved it and has been wanting to do another one ever since. That one looks so fun! What a great weekend! I'm looking forward to the days when we have the house settled (minus wall hangings) and can enjoy our city. And what a gal of many talents, love your paintings!